The remains of the Roman encampment overlooking the low ground by the river, are on plan nearly a rectangular parallelogram of 888' by 333', but the W and most of the N sides have been destroyed. A small, though perceptible deviation from the straight line exists in the bank and ditch of its E side. G Chalmers 1887-94; Information from Col. Imrie, January 1799. 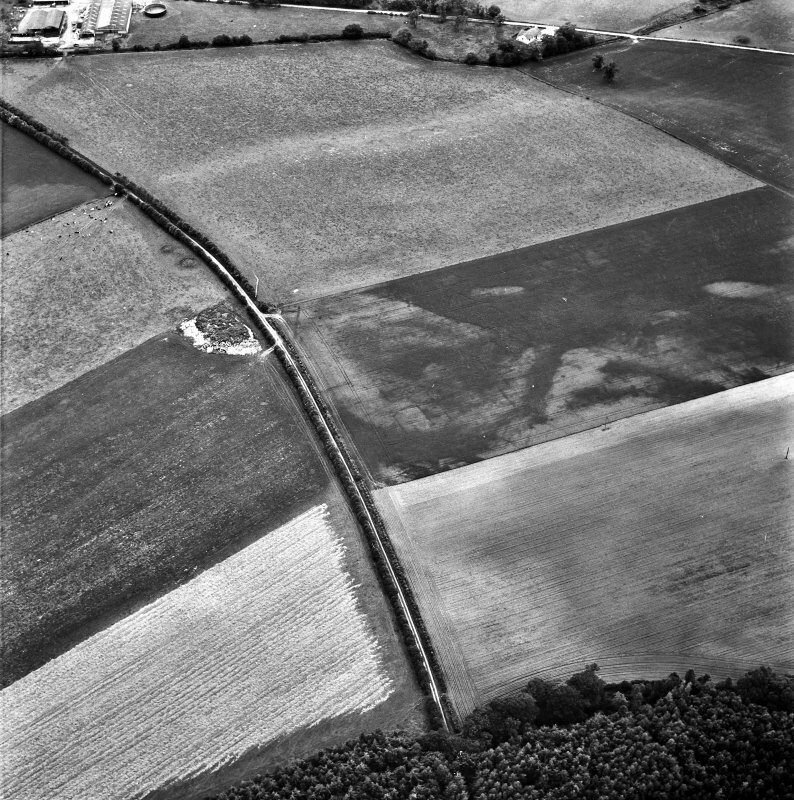 Lack of mention by Chalmers of defended entrances tells against this being a Roman camp, as does its size, since it would appear to be smaller than any known Roman camp in Scotland, although it does compare with the north marching camp at Chew Green (Northumberland) The suggestion that it is Roman is supported by its site and by the difficulty of assigning it to any other period. Stuart records the ditch having been cleared out some years previous to 1852 when only a few amulets or beads of partly coloured stone (R Stuart 1852) which do not sound Roman, were found. 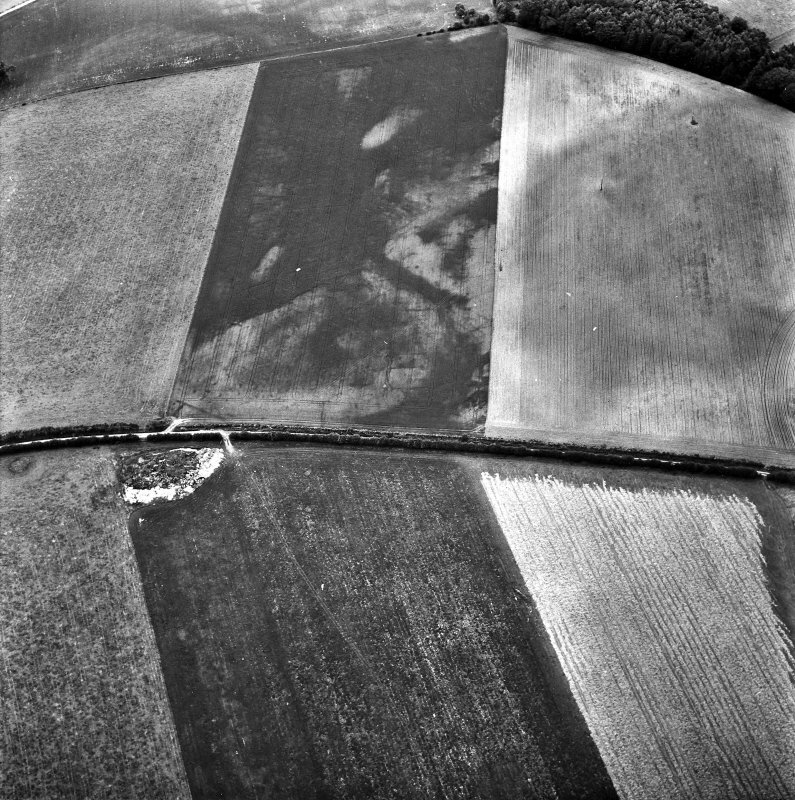 Air investigation in May 1943 revealed to R F Jessup a "rounded southern corner" SW of the published site; and in September of the same year he saw the cropmark of a ditch which, he is almost certain, links up with the corner previously seen. 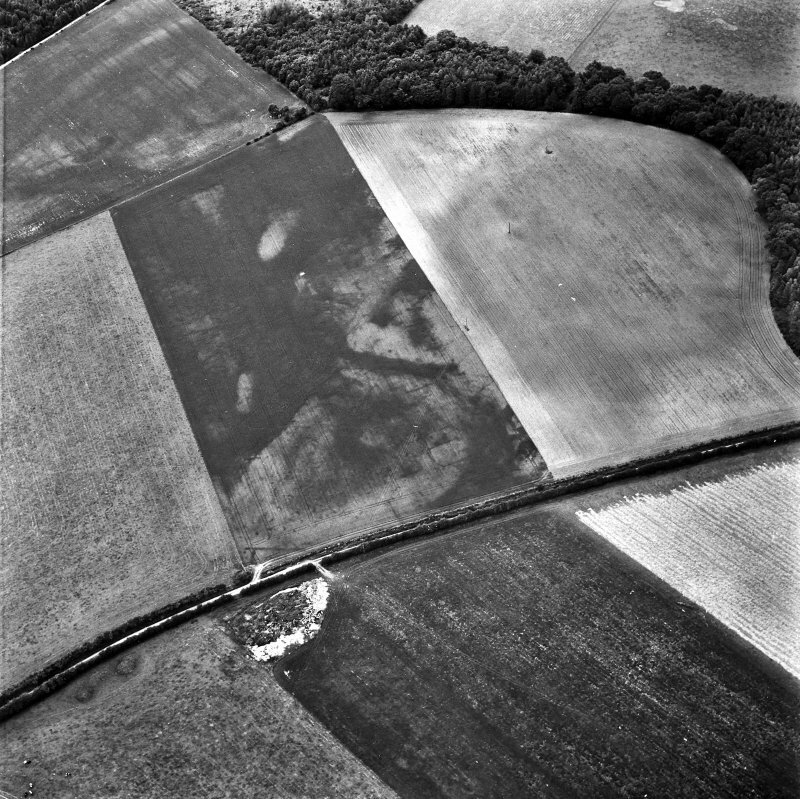 He also saw "serveral large dark cropmarks, presumably pits, and what might have been a road travelling eastwards". This tends to confirm the Roman origin, but there is still an elment of uncertainty that only excavation can clear up. The NW side of the camp is formed by a steep cliff about 50' high. O G S Crawford 1949; R Stuart 1852. There are no visible remains of this 'Roman Camp' which is mainly in an area taken up by a disused military camp situated on a flat plateau to the SE of a steep natural slope. At the rear of the house known as "Romancamp Gate' situated at NJ 3599 6188 and close by an old well, two small pieces of silverware approx 3" long and dated AD 51, were unearthed by Miss Philip (Romancamp Gate, Bellie, Moray) in 1964. These are being examined by the British Museum, who have not yet returned their findings. Excavation of the area is expected this year. No trace of this earthwork. Keillar (I Keillar, Secretary Elgin Soc) recently conducted a soil resistivity survey along the SW side published on OS 6" and trial trenches showed a shallow ditch no more than 2 1/2ft deep and 5ft wide in a hard pan close to the present surface, but he found nothing to prove it Roman. He is aware of Jessups observations, but has seen nothing personally. 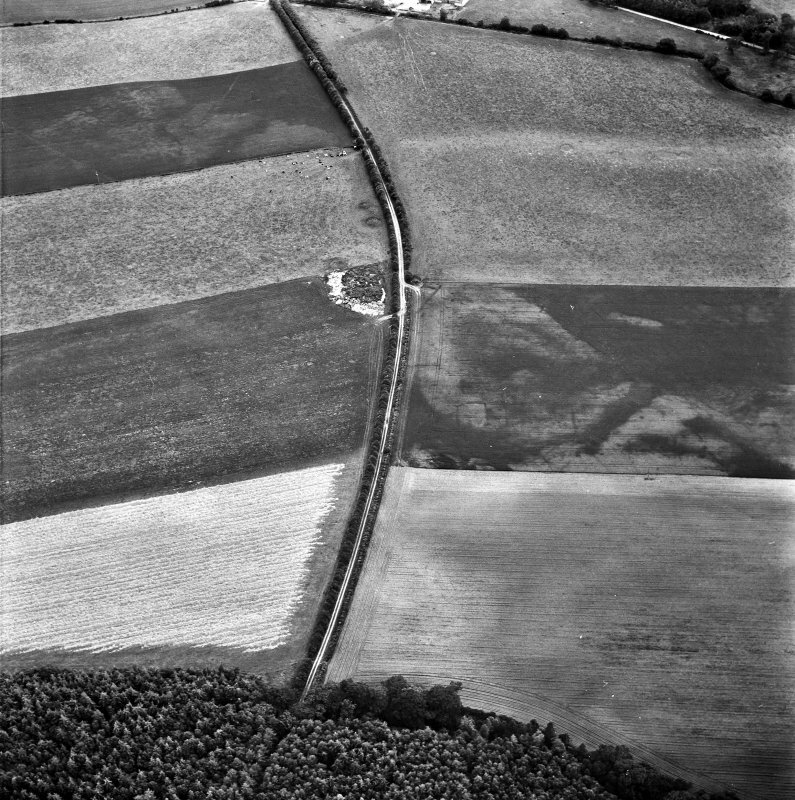 Three trial trenches across three cropmarks by I Keillar and B Jones. Manuscripts from the Barri Jones collection. Resistivity survey conducted by I Keillar.